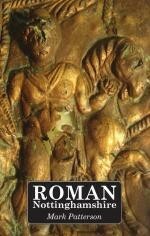 To shed light on the Roman city of Margidunum (near Bingham) digs and research were undertaken in the 20th century, and now, at the beginning of the 21st century we have a comprehensive book about Roman Nottinghamshire written by Mark Patterson (Five Leaves, Nottingham, 2011). But with local people the preoccupation with the Roman past goes back a long way; its remains turned up whenever fields and gardens were ploughed and dug up. In the December 1896 edition of Notts & Derbyshire Notes and Queries a “Native of Bingham” submitted the following article, clearly dipping into a current of thoughts and opinions that were of interest to the wider community. Was he right – or very much mistaken? All is revealed in Mark Patterson’s Roman Nottinghamshire. “Castle Hill Close, Bingham. —"Castle Hill Close" is a field some nine or ten acres in extent, and is situated on the Foss Road . It may have escaped the notice of your antiquarian readers. It is part of the supposed site of a very important Roman station — no other than that of the ancient city of Margidunum. Most antiquaries concur in the belief that this is the central station between Leicester and Lincoln, as it agrees exactly with the itinerary of Antoninus Pius. This field con­stitutes more than one-half of the extinct city, the other portion being in the parish of East Bridgford —the Foss Road running between the two portions. Few antiquaries will dispute this, for whenever there is an excavation, Roman pottery and coins turn up. The neighbouring bridle-road to Gunthorpe Ferry is, in my opinion, the veritable Ad Pontem. I respectfully suggest that this romantic lane is the much-controverted Ad Pontem — "to the bridges" — for it leads direct to the Bridgford side of the old Gunthorpe Ferry. I am afraid this will raise a hornet's nest. What is more reasonable than to suppose that in the Roman times some notice was affixed at the Margidunum end of the lane, and abutting on the Foss, close to the field above alluded to, in order to guide those who wished to go to the ferry or ford. The old Roman Oldwark Spring still bubbles up near this spot, a lovely spring of pure water, always gushing plentifully, no matter how dry the summer, and flowing through the numerous fields to Car Colston, and much further. Some day, perhaps, when the Bingham Parish Council are more on the alert, and require a better supply of water, they will utilise this never-failing plentiful supply, within one mile of their town, which at present is supplied only by wells and pumps. A Native of Bingham. Huntingdon Street,Nottingham.